Creamy Chicken Has something to say! I have a dream that some day everyone will help rescue my family from the torture and suffering that they are subjected to. I would appreciate it if you could see things from a bird's eye view" Creamy Chicken, 2010). Birds that are used in the commercial egg and meat industry have been mistreated and abused for centuries. In 2012 the laws were changed to make battery hen cages a bit larger, but the abuse still continues. The birds are not allowed to free range, and the reasons given are that they cannot adequately protect the birds from predators and disease, (I guess they never heard of solar powered electric fencing, chicken runs, and poultry netting). The real reason they do not free range chickens used in the commercial egg and meat industry is feces, yep that is the reason. Feces build up and contaminate water supplies. Poultry feces have to be managed properly. The easiest way for them to do this is to keep the birds over a manure pit because they do not want to take the time or the extra expense it would take to rake feces up and rotate the birds to fresh pastures. As a result, the hens in the egg industry are used for their eggs until they are no longer at peak egg production and then they are discarded and used for dog food and other things. Male baby chicks are sorted and stacked into barrels alive, suffering, starving, crushing one another, and then gassed sometimes days or a week later if they are not already dead. Broiler chickens are housed in over crowded sheds until they go to slaughter in 6-8 weeks. They are genetically altered to gain weight fast and fed feed that helps them to gain weight which cripples them to the point that most can barely walk, they never go outdoors or get to do anything a chicken gets to do. I feel that these birds and animals are doing us a great service providing food and should be treated as humanely as possible during their short lifespan, out of respect for their sacrifice if nothing else. 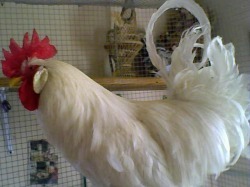 I met my wife Creamy chicken when she was rescued as an abandoned hen. Creamy is beautiful. She has pretty white feathers and delicate legs. She was not always this way. When I first met her, she could not walk and had very few feathers. Creamy was sick for a long time. I decided that she was special and that I needed to take extra care to protect her. So I gave all my hens to Mr. Buttercup and I spend all of my time with Creamy. She is quiet and sweet with none of the jealousy that the other hens have. Creamy needed me and still does to this day. Two months after she was rescued she laid a perfect egg. She was too weak to hatch the chick, I had to sit on our egg. One day the shell had a little hole in it and I heard..peep..peep....peeep! Soon after our daughter was born. Our people who take care of us named her Country Gravy. Country is the curious type and is always looking at things. She is never satisfied with the status quo and she is always asking us questions..
Today Country has something deep in her heart she needs to say and unlike her quiet mother Creamy..Country will not be still until it is resolved. Country Gravy's Message to You! I am thankful for many things and one of them is that I am not a battery hen. I am so happy that I have a happy home with people that love me. I run around and play most of the day. I love to peck at tasty little bugs, clean my feathers, take dust baths and run in the fresh green grass chasing butterflies. I am sad today because I have seen these video's (my people let me watch them when they play with their computers!) My chicken family is not so fortunate. 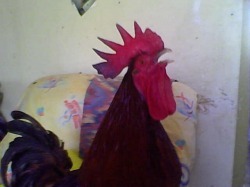 My mother was a rescued battery hen who was courted by a beautiful rooster named Angel who protects her and loves her. I am an only child. They say she was not strong enough to sit on me herself so I had to be incubated by my father Angel and here I am! The world is so beautiful to me but my mommy says that it was not beautiful for her and daddy assures me no one will ever hurt mommy again. Wont you help me to help the rest of my family, my aunts, uncles and cousins who are being abused and neglected right now? Pleeeeeeeeese! I have been a good girl all year, I even laid my first egg! Mommy and Daddy said I am not old enough to hatch it. I sit on my people- lady, Penny's lap and watch television and sometimes I chase the arrow on her computer. My people-man, John takes me worm hunting. He digs up holes and lets me get the worms and bugs. Many people eat my eggs and say their very tasty. Since I have been such a good girl, I thought maybe you could help my family by not buying commercial eggs, contacting state and local officials, create a website to let people know whats going on and share it with your friends or...I know! You could raise your own backyard chickens! Then you would know that your eggs came from happy mama's and not battery hens! Buttercup is croooowing out a message for you! Hi There! My name is Buttercup! I just thought I would drop by to say hello and lend my support. I am a friend of Country Gravy. I have a girl's name because my people bought me from some people that thought I was a girl. It is a good thing that they did think I was a girl. I seen what they did to my brothers and all of the other little boys! They were only a day old when the bad people threw them into a large trash barrel ..they were still alive and hopping around trying to get out! The people there were very bad. They left the other boys in that barrel for days, some of them suffocated as they struggled to reach the top and get out. Some of them were too weak. A few days later a big man came and gassed the ones who were still alive and killed them! I cried for days for my brothers and my cousins. I was one of the lucky ones! Someone came and took me away to a feed store where the people who have me now brought me to a place that all of the battery hens clucked about when the bad people left them alone. They told us of a place called Chicken Heaven where hens could stretch their wings, eat all they want, take dirt baths and play in the grass..and most important too me is that they don't kill little boys in Chicken Heaven...I wish I could tell them that I made it here...I wish someone would help me rescue my family..WILLLL YOOOOUUUU?????? Check out our other pages related to this, "Wolf in the Hen house!"